I have missed blogging these past few weeks but work has been über busy and I have started to prep for back-to-school and seeing friends before they head back to university so free time has been scarce. However, before school starts back up on September 7th my mother and I wanted to go on a little trip somewhere. I have never been to Seattle but it is home to so many incredible landmarks (The Space Needle, for instance) and hasbeenthe setting of so many well-known and loved movies and TV shows (50 Shades of Grey, Sleepless in Seattle, Grey’s Anatomy, Frasier). We left home on Monday, August 22nd, taking a local ferry down to Seattle Pier. I live near Vancouver, BC, and Seattle is so close but strangely enough I have never been there. We arrived and explored the hotel for a good hour or so because it was so gorgeous. 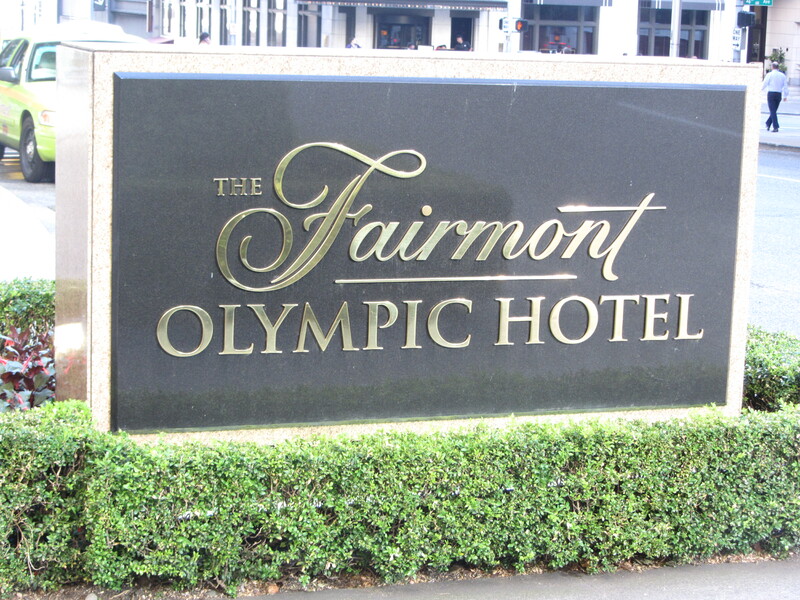 We stayed in the Fairmont Olympic Hotel because of my mother’s love of Fairmont Hotels, and because of her amazing internet sleuthing skills when it comes to finding great hotel prices. We then headed into The Terrance, a nice little lounge and bar, for a drink. And this is when I learned, much to both my mother’s and my horror that, at 20, unlike in Canada, I am not of legal drinking age in the US. Thank goodness the server recognized the error and chalked it up to a simple mistake. Just imagine the headline “Tiny Canadian Girl Shuts Down Renowned Lounge and Bar for Serving Alcohol to Underage Minors.” That would have been bad. For dinner, we went to Shuckers, a well-known seafood restaurant attached to the hotel, and I had some of the tastiest fish and chips and THE BEST chocolate cake. Like ever. Ever ever. On Tuesday, I got us very lost in downtown Seattle when I took a wrong turn. We ended up down near the courthouse but eventually we found our way back to the hotel, and then set out for Pike Place Market. The market was unlike anything I had ever seen, so many stores selling anything you could think of and all the walkways clogged with people. We also checked out the Gum Wall, which was an equally cool and gross sight. The Pike Place Market is also home to the first Starbucks so, of course, we went inside and picked up some drinks and a commemorative mug. For lunch, we stopped into Beecher’s, a local cheese maker, and had the best freshly made macaroni and cheese I have ever tried. I don’t know what import laws say about bringing American cheese across the Canadian border but I didn’t want to test it so I unfortunately did not fill my suitcase with the Beecher’s Flagship cheese. After lunch, we walked to Macy’s and had a quick browse before purchasing some incredibly warm and foldable down coats and heading off to Zara. Tuesday night my mother and I both checked an item off our bucket list: I got to see a National Baseball League game, the Seattle Mariners against the New York Yankees, and my mother got to see the Yankees play. The game started out slow but then the Yankees pulled way ahead of the Mariners, eventually beating them 5-1. A minor item on my bucket list was also checked off: eat a stadium hot dog and scoot by people to get to my seat while holding it. I have seen so many characters in movies do it that I just had to do it once. And I did. The hotdog was pretty tasty too. We kicked off Wednesday morning with an early trip out to see the Space Needle. Apparently it completes one rotation every 47 minutes and, though I don’t want to sound like one of those people who claim to have superhuman perception, I feel like my sensitivity to motion was enough to feel it actually move so I got a little queasy. It was hands-down the best aerial view of the city and well worth the admission. We then made our way back to the hotel for Afternoon Tea, a lovely tradition we indulge in on our all trips together. The 1907 blend was classic and flavourful, and the first course of berries was divine. There were some strange flavour combinations in items on the tea tier though, such as a beet macaroon. Full of tea and goodies, we headed out to Nordstrom, an American department store I have always wanted to see because luxury brands like Louboutin and Prada are next to Highstreet brands like Guess and Vince Camuto. I fell in love with a $1000 pair of Vêtements platform boots and kept trying them on but there was no way I could afford them (now on the hunt for a dupe). We also visited Barnes & Noble, a bookstore I have heard so much about but never seen. It surpassed all my expectations and I picked up the September issue of Vogue. We then explored Pacific Place which turned out to be less exciting than I had hoped but it had a Kate Spade store and I spent a good hour in there talking to the lovely sales associate about Kate Spade’s retirement and the sale of the company, and how awesome some of the styles are (a cruise ship purse, for instance). To finish off the day we ordered macaroni and cheese, French fries, and cake from room service as a meal bundle. (I ended up keeping the cake in the fridge overnight and eating it at the pier the following morning because I know what a balanced breakfast is). We left Seattle Thursday afternoon, but not before enjoying an amazing breakfast at The Georgian, yet another restaurant in the hotel. I had the to-die-for eggs benedict, which kept me going for the whole day (until the chocolate cake, that is, but I couldn’t bear to throw it out). All in all, this was a fun and exciting little getaway before my mother and I go back to school and work, but I will definitely be hitting up the gym in my first week of classes to work off all the food I consumed. No idea why, but I always eat way more on vacation than I ever would at home.